Detailed drawings of a tool developed to accurately cut the rabbets on the perimeter of guitar bodies for the binding and purfling. Inspired by a design by Don Williams (www.dewguitars.com) who adapted a design by Harry Fleishman (www.fleishmaninstruments.com), this great tool has been refined again and has been documented into easy to follow drawings. The parallelogram design of this fixture holds the laminate trimmer base perpendicular to the sides. This allows the router bit to cut the ledge around the guitar accurately, not being influenced by the curvature of the top or back. 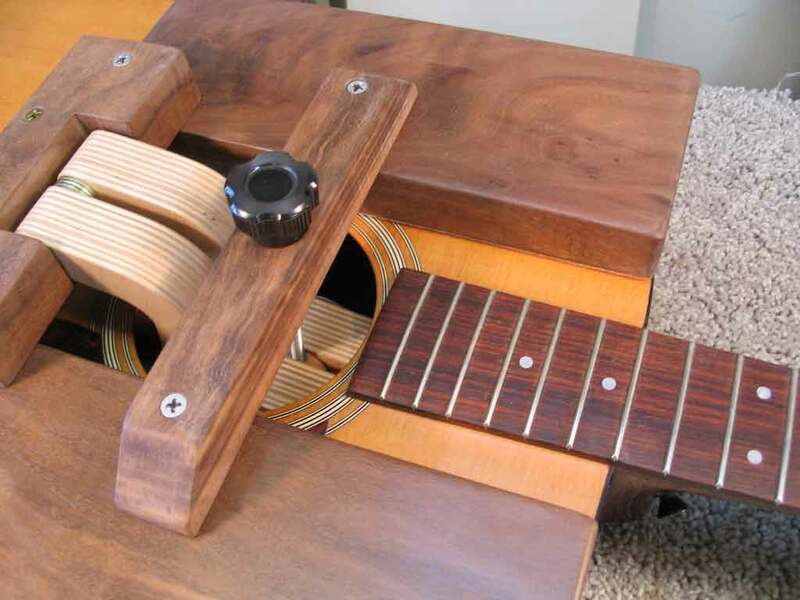 The linear bearing action of the drawer guides and the pivot bearing action at the base allows the trimmer to "float" smoothly around the guitar making this once nerve-wracking job actually fun. The drawings we are offering are detailed and accurate. Each part is drawn separately and all the hardware sources are specified in a list of materials. Use of the fixture is fully explained on a separate instruction sheet. There are three sheets in the set measuring 11" x 17". These Drawings are for a tool developed to shape back braces quickly and accurately to 15 foot radius with your router table and pattern bit. Other radii may be available upon request. Drawings are accurate and detailed. A full size pattern for the base is included with 15' radius. All hardware is listed and sources described. The tool is made from Baltic Birch plywood and has an aluminum guide strip built into the base for long wear and accuracy. The toggle clamps hold the brace down tight to the base and in the 6 seconds or so it takes to guide the tool against the bearing on the pattern cutting router bit, you have a perfectly shaped brace ready to glue. 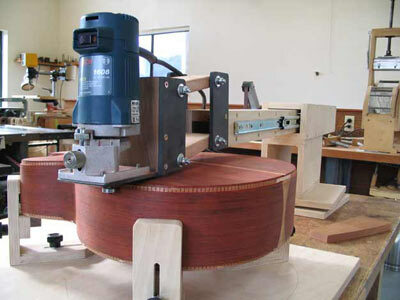 This is a production tool for guitar makers who need to duplicate this radius safely, quickly and accurately. There are two sheets in the set measuring 11" x 17" and a full size base pattern. These Drawings enable you to make a cutaway press modification to your existing bending machine. If you want to make a 'Venetian' or 1-piece cutaway using your existing bending machine, these drawings will help. This press is very easy to construct. The 'high-dollar' items are the heating blanket and controller. The press itself is very inexpensive to build. The most expensive part is the screw press at less than $20. The stainless steel ram conforms to your cutaway design. The drawings include an explanation of how to modify your bending machine to accept this cutaway press. A heat blanket and controller are a must for this operation. The result is well worth it. These Drawings enable you to make a tool developed to radius a fingerboard quickly and accurately using your router. They are accurate and easy to follow. Each piece is detailed separately. A full size pattern sheet is included with 7.25, 7.5", 9.5" and 10" to 24" radius outlines in 2" increments. All hardware is listed and sources described in a bill of material. 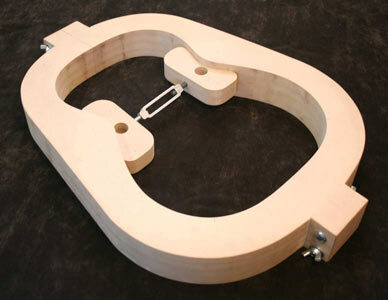 The tool is easy to make, using Baltic Birch plywood, hardwood and a few basic hardware items. Use of the fixture is fully explained on the drawing. There are three sheets in the set measuring 11" x 17". You can accurately radius your fingerboard in just a few minutes using your router to nearly any radius or combinations of radii. 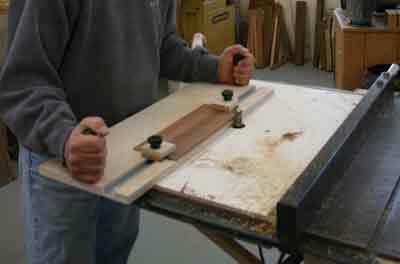 Minor sanding is required after glue-up to the neck. 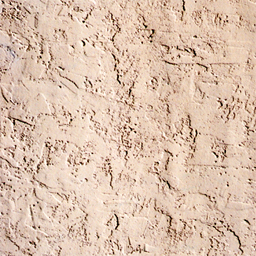 As shown in the close-up above, there are just a few machine marks to sand out. 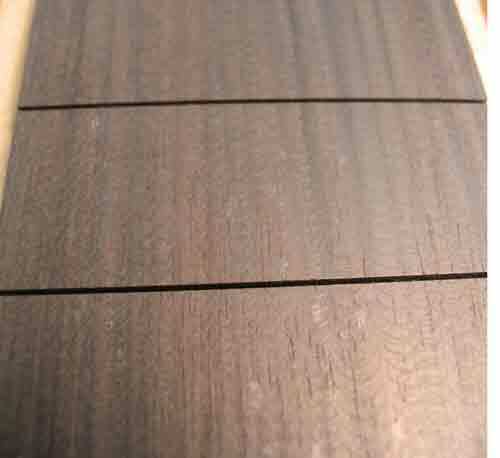 Pictured is an ebony fingerboard with a 16" radius at the nut end and 24" radius at the body end. The entire process took less than 4 minutes. Detailed drawings to make a fretting support tool. 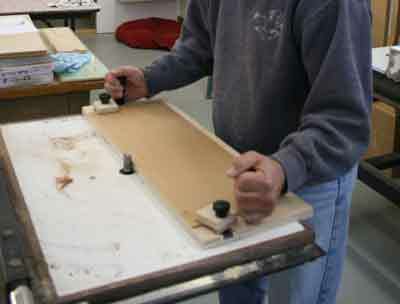 When fretting or re-fretting, the part of the fingerboard over the guitar top needs to be supported. The mass of the buttress absorbs the shock of driving the fret wire into the fingerboard. These drawings are detailed and easy to follow. Each part is individually drawn and dimensioned. The drawing package consists of (2) 11x17 inch pages and a full size pattern for the plywood support links. This tool is a must for protecting the guitar from damage. 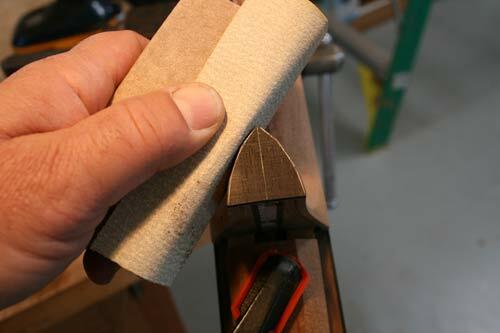 Easy to make, the Fret Buttress is worth the few minutes it takes to create. Mold making, constructing hollow forms and proper neck set are completely connected subjects. We are making available detailed drawings and instructions for making useful molds for guitar construction. 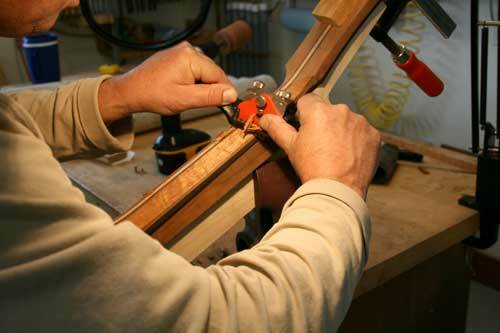 Proper neck set can be achieved by shaping the sides of the guitar and thus "aiming" the neck at the correct angle. 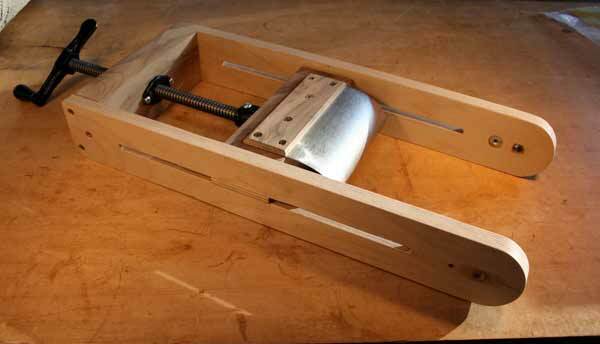 Hollow forms are very useful in guitar making and mold construction. They are pretty simple to make and any radius can be applied. These drawings are accurate and easy to follow. Use of the tooling is fully explained on the drawings including achieving proper neck angle. There are four sheets in the set measuring 11" x 17" plus a full scale pattern for the sides of the hollow form box for making 15', 28' and 30' hollow forms. Also included is the address for a pictorial help web page for construction and use. Make molds to shape the sides quickly and accurately and prepare them for proper neck set. These Drawings enable you to make a fixture developed to joint the center edge of tops and backs in preparation for glue-up. 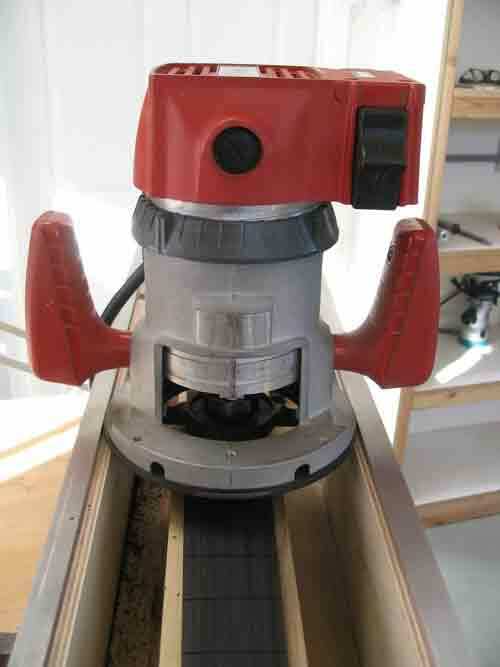 This tool is used with your router table to create perfect joints every time in less than a minute. The drawings are accurate and detailed. All hardware is listed and sources described. The tool is made from Baltic Birch plywood and has an aluminum guide strip built into the base for long wear and accuracy and is very easy to make. The adjustably spaced clamps hold the top or back down tight to the base and in the few seconds takes to guide the tool against the bearing on the pattern cutting router bit, you have a perfect joint edge ready to glue. The hold down clamps can be adjusted to joint a jumbo guitar top or a concert ukulele and everything in between in seconds. There are two sheets in the set measuring 11" x 17". Also included is the address for a pictorial help web page for construction and use. Of all the pieces of this machine, the ones our customers have the hardest time procuring are the springs and the aluminum waist press plates. At this time we are offering the 10 extension springs as shown in the photo above. These Drawings enable you to make a tool developed to quickly and accurately bend sides for acoustic guitars. The guitar sides are bent between two sheets of spring stainless steel with support from the underside to reduce the possibility of splitting or breaking the sides. This tool has been around for a long time and works really well. It's surprisingly easy to build and not that costly. Pictured is the one I constructed 30 years ago. It has bent a lot of sides and is still going strong. I have made a number of modifications over the years and have included them in the drawings. I explain how to use 200 watt light bulbs as heat source as shown which was used for many years or the preferred method of heating blanket as we now use. These Drawings are accurate and easy to follow. Each piece is detailed separately. All hardware is listed and most sources are described in a bill of material. The tool is easy to make, using Baltic Birch plywood, hardwood, a few basic hardware items, a press screw and 2 pieces of stainless steel sheet. Use of the fixture is explained on the drawing. There are three sheets in the set measuring 11" x 17" plus a full scale pattern for the sides of the machine. Detailed drawings of a very cool tool for clamping top and back halves together on your acoustic guitar quickly, with the proper amount of force and keeping them flat. There are many ways of performing this task, but we have a new twist on a centuries-old technique used in Spain by the masters. 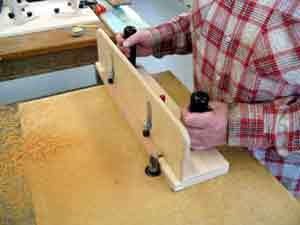 This tool works equally as well with odd shaped tops and backs or regular, squared-off shaped. 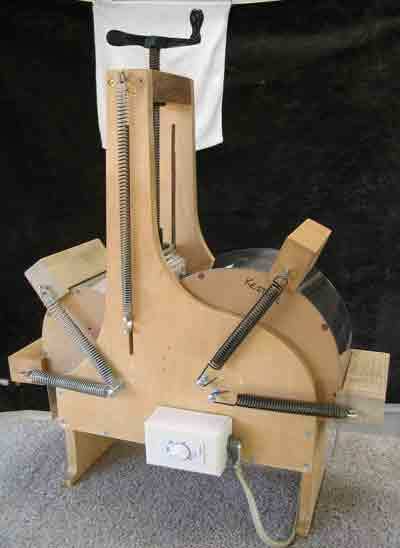 There are detailed drawings of the base, shoes and clamping wedges and a list of materials. A separate sheet is included with complete instructions for use. There are two sheets in the set measuring 11" x 17". Nearly every time someone plays one of our guitars, the first thing they say is, "Nice neck." We are offering Drawings and a step-by-step online photo help page address to show you how to make a great neck every time. The drawings also detail a Neck Clamp that you can use with your vise to hold the neck while shaping with a few simple tools. Shaping a neck can be done quickly and accurately by creating facet lines and shaving down to points tangent to the neck curve. Starting with a neck that completed to the point of beginning the shaping process, we will show you how to make these lines and blend them into the heel and the headstock. The drawings we are offering are detailed and accurate. 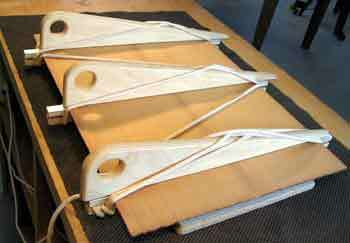 There is one 11" x 17" sheet showing how to construct the Neck Clamp and the dimensions for the facet lines on the neck. There is an 8 1/2" x 11" sheet with full size patterns on it.